This week we’re helping you create a serene ambience in your home by adopting a relaxed yet glamorous approach to your interiors. This understated look will help with the stresses and chaos of everyday life. As we welcome the new season and the days start to feel a little shorter and a lot darker you’ll need a little pick me up to get you through the week, so what better place to start than your home. Imagine coming home to a peaceful and tranquil cocoon, a serene bubble away from the hustle and bustle outside. When our team at Litecraft HQ think of a relaxed interior we channel the simple and symmetrical trademark look of Interior Designer Kelly Hoppen, her work focuses on order, structured designs and simplicity. 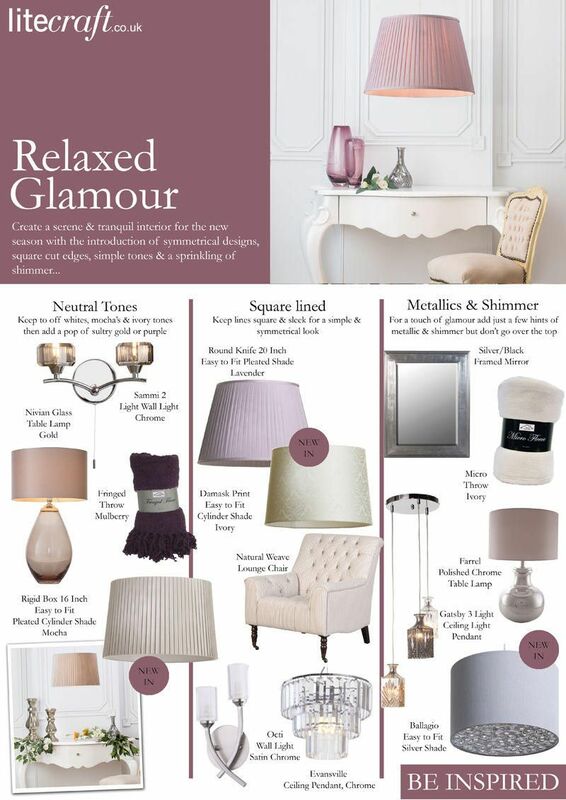 For inspiring images of relaxed glamour interiors head over to our new Relaxed Glamour Interior Guide. 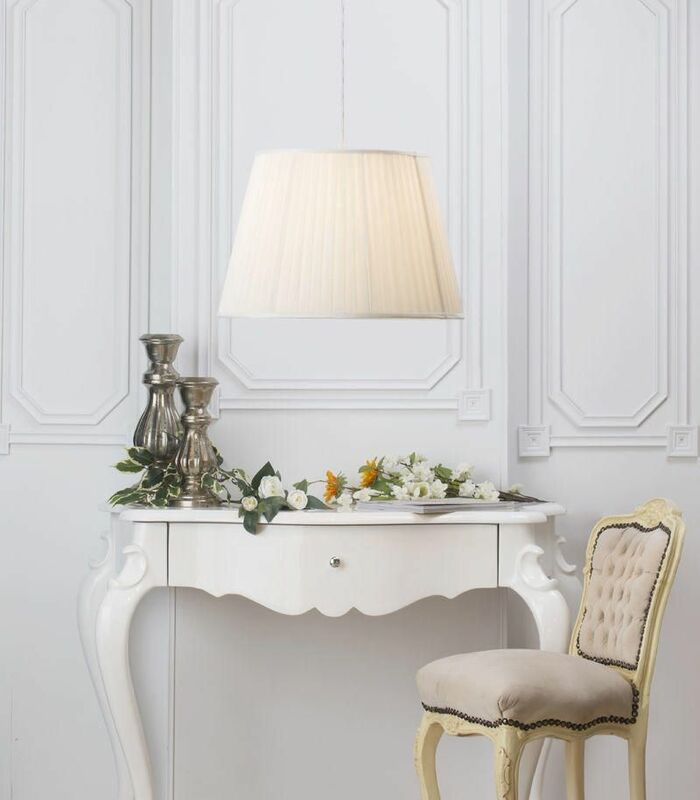 The key to a relaxed glamour interior is symmetry, so when choosing lighting, accessories and furniture for a room think about how you will place these items. For instance, in the lounge you could use your sofa as a central point, include side tables either side with matching table lamps. Colour coordinating cushions and throws neatly placed in a symmetrical layout will give off a relaxing and calm vibe. Having a chimney breast and fire place is also a great way of creating a central point for the room, hang a piece of contemporary art or a mirror above in a central position. The same can be said for the bedroom, use your bed as the central element with twin bed side tables and matching table or wall lights either side. You can easily recreate a relaxed glamour interior in any room, just think about the main furniture for that room, such as the island or cooker in a kitchen and a dining table in the dining room. Begin with your palette, most serene and relaxed interiors centre around a neutral spectrum so keep to simple tones such as creams, mochas, ivories and off-whites. You can add colour later with the use of cushions, bedding and ornaments. Keep to this colour spectrum when choosing furniture too. Avoid busy patterns and large prints as this may create a claustrophobic feeling, instead choose subtle prints such as neutral monochrome stripes or a cream mottled paint effect. Not all homes can pull off the over-the-top glamour look, but you can create a similar feel with hints of rich colours and sprinklings of shimmer, just don’t get overexcited with your accessories. We’ve included our Fringed Throw Mulberry as a rich pop of colour but you can choose any colour you desire. By adding simple touches of glamour and staying away from a glitz-overload which can put off guests and is also not beneficial for a relaxed décor you can create an unfussy and welcoming feel to your home. Add glass and mirrored elements such as furniture and wall art for a hint of glamour and choose sequin and silk scatter cushions for your soft furnishings. After you’ve added your glitzy elements you should strip back the notion of glamour by adding simple fabrics such as linen and fleece in complimenting neutral colours. We have a range of fringed and fleece throws to help you create that relaxed feel. When choosing lighting for a relaxed glamour interior think about modern designs as oppose to ornate and traditional. For instance, chandeliers with elaborate detailing, crystal effect droplets and crystal cut sconces may appear too much for a relaxing interior, grandeur and sparkles can be too ‘bling’ for some. However, you don’t have to rule out all statement lighting, just think about more simpler designs. Choosing square cut glass fittings as oppose to tear-drops will instantly give a more modern impact. The crystal glass aspect with still reflect a glamorous edge but with a more contemporary finish. Our Evansville 1 Light Ceiling Light Pendant is the perfect example of relaxed glamour, featuring three tiers of tightly hung rectangular crystal effect bars, each piece of glass bounces sparkling light around the room. 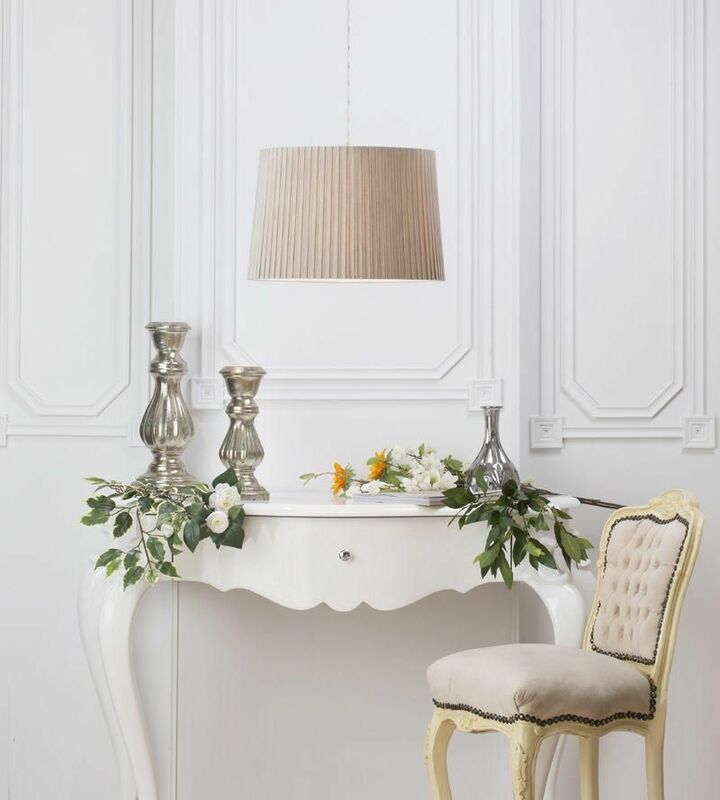 For a quick fix opt for our similar Istanbul Easy Fit option, boasting a similar three tier design you can easily fit this piece around your existing bulbs for that quick relaxed glamour update. The same goes for wall lights, choose square, hexagonal or rectangular glass shades as oppose to round of floral style. The streamlined square element is a lot more relaxed and contemporary, don’t forget to place one either side of your bed or chimney breast for symmetry. Take a look at our Octi Chrome Range for a refreshing frosted finish or our Sammi Range for a sultry smoky look, both ranges feature squared and hexagonal cut glass shades on a sleek chrome fitting. For a seamless look why not go ultra modern with our Left Hand Bedside Light in Satin Silver. If you’re updating a rented property or in need of a quick update and therefore unable to choose an electrical fitting, think about a simple lampshade. Litecraft stock a range of glamorous lampshades that boast a relaxed design in a selection of glam colours. Our Rigid Box Pleat and Round Knife Pleat Shades are our newest designs and just perfect for a relaxed glamour approach. Featuring a simple pleat design these shades are available in sultry glam colours including ivory and lavender. 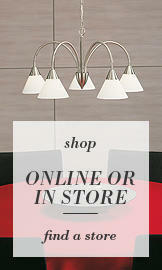 Check out yesterdays blog for more on our new lampshade collections. 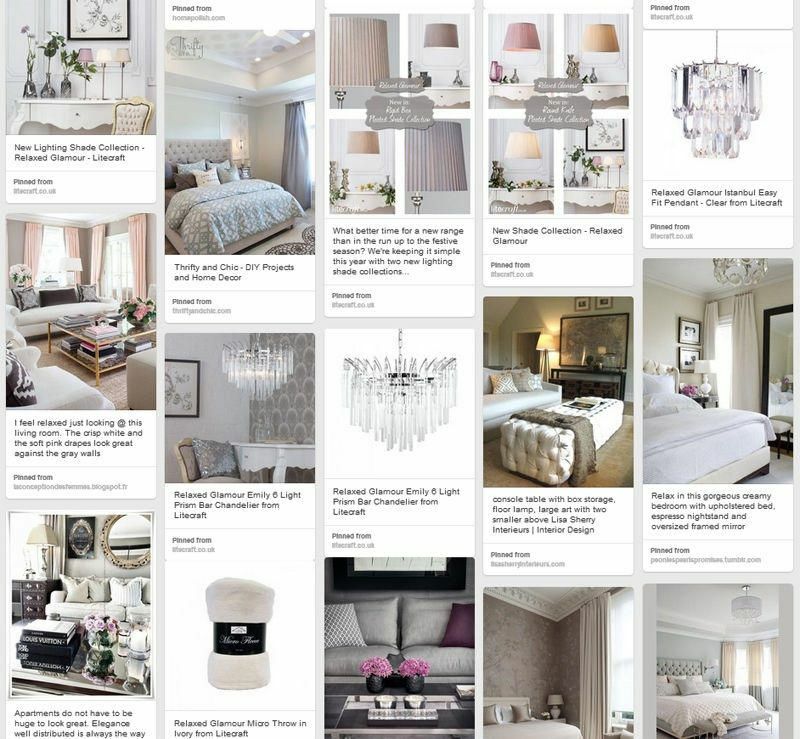 Here’s our weekly look book pulling together three simple tips for a relaxed glamour interior. First chose fittings in soft neutral tones such as our Smoky Sammi 2 Light Wall Light, our Rigid Box Mocha Pleated Shade and our Nivian Glass Table Lamp in Gold. For hints of colour we chose our Fringed Throw in Mulberry and our Round Knife Pleated Shade in Lavender. Keep lines square and sleek for a simple symmetrical look, this will keep your interiors feeling fresh and up to date. Our Gatsby, Evansville and Octi Range are the perfect square lined fittings, compliment with square or rectangular mirrors and wall art. Finally add some metallic and shimmer, for a touch of glamour add just a few hints but don’t go over the top. Just introduce hints such as sequin cushions and mirrored furniture. Our Farrel Polished Chrome Table Lamp has just the right amount of pizazz featuring a polished chrome bulbous base with a high shine finish which is subdued by the neutral fabric shade. Are you a fan of the relaxed glamour look?